Just got this email. Check your emails if you're subscribed to Google Home or Google Home Mini emails, and have a Google Home or Home Mini. Make sure you login to the Google Play Store using your Google Home account to redeem. 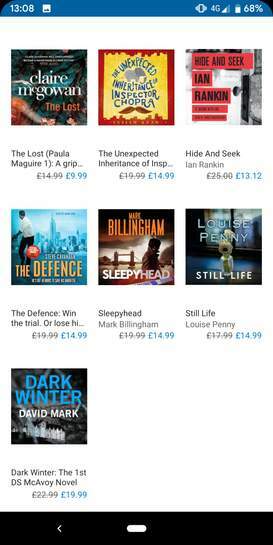 Valid for one (1) copy of an audiobook from eligible titles on Google Play: The Lost, Dark Winter, The Unexpected Inheritance of Inspector Chopra, Hide and Seek, The Defence, Sleepyhead, or Still Life. 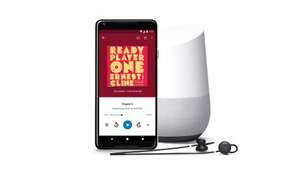 Open to participants who receive a promotional URL from the Google Home newsletter. A Google account is required to redeem. Redeem your offer by April 6, 2019. Select your audiobook and checkout by April 13, 2019. Limit one (1) per user. No exchanges. Valid in Great Britain only. Age restrictions apply. See Google Content Promotion Terms and Google Play Terms for more information. Promoter: Google Commerce Ltd, 70 Sir John Rogerson’s Quay, Dublin 2, Ireland. Sleepy head, awesome book, by an awesome fellow. 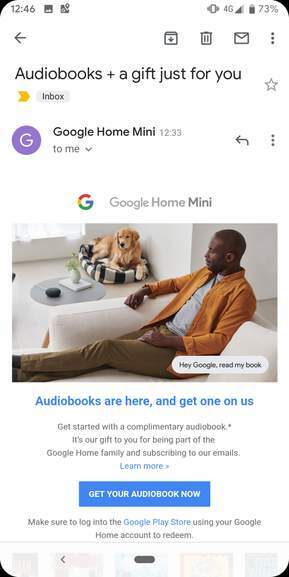 Admittedly I was typing this in a rush and that image was for illustration purposes only, as to show how the audiobooks can work with the Google Home and Home Mini. I will update the image. Sorry for any inconvenience! Got an email about this just now. Reminds of when they used to give free movies on Google Play too every now and then! Think I'll go for the Inspector Chopra book. Just a reminder-lots of local libraries offer access to free audiobooks via the Libby App'. I thought this was great when I forst got the email, until I realised it was only from a choice of 7. Heat anyway of course. Nothing that really interests me. Prefere fantasy or sci-fi. Shame must be for specific users never seem to get the choice sadly.